From the silky smoothness of a baby's skin to the deep wrinkles of an 80-year-old, perhaps nothing reflects the movement of time as well as skin. It functions normally till puberty; thereafter, around adolescence, clear wrinkle-free complexion starts getting hit by the onset of pimples. 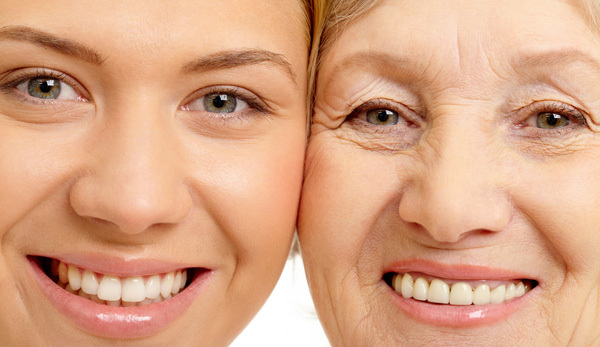 As you age, skin gets less stable due to genetic changes and sun damage further adds to skin woes. Certain factors of natural aging are beyond our control. But today, we know that the sun, and not just our genes, can be blamed for skin turning blemished and wrinkled. Some of the ways to limit this damage is by avoiding excessive sun exposure, using protection against UV rays, not smoking, limiting alcohol intake, choosing a skin care regime ideal for your skin type and even including anti-aging creams as early as in the 30s. Epidermis – As we age, the top layer of the skin becomes thinner, the rate of skin regeneration reduces and the surface becomes uneven and feels rough. Dermis – Over time, the two building blocks of the dermis, collagen and elastin start breaking down faster than they reproduce. This results in wrinkles and lines, open pores, skin laxity, easy bruisability and prominent blood vessels. Pigmentary Changes – Sun damage spots appear and pigmentary changes are more pronounced. Loss of fat – This is common below the skin, in the cheeks, temples, chin, and eye area, resulting in further loosening of skin with creation of grooves, folds and sunken eyes. Bone loss – This is commonly seen around the ages 50 and 60, around the mouth and chin. Cartilage loss – This may happen around the nose, leading to drooping of its tip. Acne-ridden teens – The most common problem at this age is acne. Time combined with increased androgen production results in excessive oil production. Also, increased outdoor activities without sun protection result in early tanning and sun damage. Wear and tear in the 20s – It is important not to neglect your skin in these years, as it heralds the onset of expression lines while laughing, talking and frowning. An abundance of collagen and elastin imparts a firm, plump and healthy glow to the face. Wrinkles are virtually non-existent but you need a good sunscreen and a regular skincare routine. Early damage in the 30s – At this stage, one can prevent premature aging of the skin. The skin still glows, but the aging process starts to show. The skin begins to lose collagen and elastin, making it less supple, and some superficial wrinkles, blotchiness, dryness and tiny fine lines begin to appear. The correct use of skincare products helps minimize lines and creases. Moisturizers cannot actually prevent aging, but can reduce its dry and parched appearance. The use of sunscreen on the face is critical. Irregularities in the 40s – In these years, it is essential to keep wrinkles and age spots away. It can be a decade of dry skin when dead skin cells stick, darker patches appear and expression lines are formed. Weakening of collagen and elastin fibres, loss of fat and muscles, coupled with gravity's pull, result in the appearance of sagging eyelids, drooping brows and hollowness under the eyes. Expect to see not only the age-related change in your skin but also larger open pores because of the breakdown in collagen. Skin becomes thinner with loss of elasticity. Skin becomes drier as a result of more prominent pigmentation. Fine lines and wrinkles get pronounced due to volume loss. Visible sun damage at 50+ – By this age, both menopause and the sun have wrecked havoc on your skin, especially if you haven't been a loyal user of sunscreen. Wrinkles, age spots, spider vein and dry skin become prominent. Women in this age group may see more pronounced wrinkles as the moisture and fat content in the skin begin to decrease. Declining levels of estrogen during menopause effect skin elasticity, pigment, firmness and tone. Estrogen contributes to sebum production, and thus when this reduces, the skin becomes drier. Estrogen also stimulates fat deposits which serve to make the face, hands and neck look more youthful appearance. Pigment producing cells, controlled by estrogen, slow down, causing irregular dark patches. 90% of pregnant women develop hyper pigmentation, an overproduction of melanin that produces dark spots. 70% develop Chloasma, also known as "mask of pregnancy". But in the months following childbirth, all the dark spots on the arms and face disappear. 90% of women develop stretch marks during pregnancy. These can be helped by using creams, lotions and with laser, especially the use of RF pixel. Severity of acne and eczema increases in some women.